Charles Stagg Rogers was born January 5, 1902 in New York City and grew up in Camden. He attended Camden High School, where he starred for the basketball and track teams—as a middle-distance specialist—as well as the football team as a wingback. Somewhat undersized at 5’10” and 145 lbs., Charley avoided crushing tackles with his speed, quickness and field awareness. He enrolled at Colgate in 1922 and transferred to the University of Pennsylvania in 1924. The transfer rule then was similar to what it is now, so Charley was compelled to play for the practice squad for a year and was only allowed to compete in track meets that were not official intercollegiate events. In the spring of 1925, Charley finished second in the national decathlon championship in Boston. 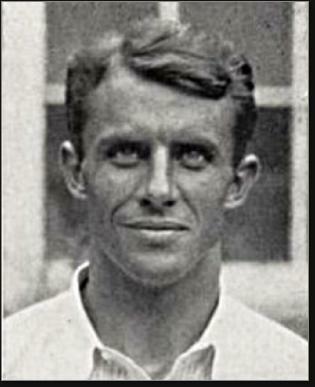 In the fall of 1925, he quickly became the star of the Quakers varsity, along with the Scull brothers (Paul and Folwell). When Charley broke into the open field, there was no one better—save for Red Grange. Charley made the winning touchdowns against Cornell, Yale and Brown. He played safety on defense and was the Quakers’ primary punt returner—a critical position in college football during the 1920s. 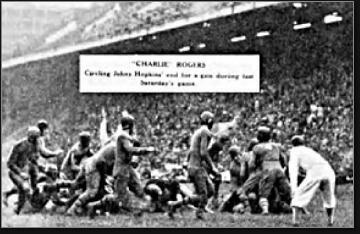 As it so happened, during the 1925 season, Penn was scheduled to play Illinois. Grange had one of his biggest days on a muddy field, while Charley was overwhelmed by the Illini defense every time he touched the ball. The final score was 24–2. In 1926, Charley broke the 1,000-yard rushing mark for Penn and was named to the All-America team. Including punt returns, he accounted for over 2,500 yards of offense that season. He also married (secretly) a sportswriter from Swarthmore named Helen Morton, whom he met while freelancing as a sportswriter to pay his tuition. After graduation, Charley thought about assembling a barnstorming team of fellow All-Americans, but even with the promotional expertise of his wife, his name recognition wasn’t enough to secure guarantees, so he dropped the idea and set his sights on the National Football League. The Frankford Yellow Jackets, who played just outside the Philadelphia city limits to avoid Sunday blue laws, signed Charley. He sold a lot of extra tickets and was the team’s top runner. During his rookie season, Charley served as a player-coach— along with Ed Weir, Russ Daugherty and Swede Youngstrom—after head coach Charlie Moran quit at midseason. Frankford went 4–4–2 under this arrangement and finished the year The team won 9 games on the season, eight of which were shutouts. They finished 7th in the NFL. Weir was named official head coach in 1928. Charley had another good season, this time finishing second on the Jackets in yardage. Frankford led the NFL with 11 victories, but because the league title was decided on winning percentage, the Providence Steamroller claimed the championship that season. In their two meetings, they tied Providence once and lost 6–0. Despite having packed on 20 pounds since his college days, the beatings Charley took every weekend finally began to wear him down and in 1929 he played sparingly. An offer to help the University of Delaware football and track teams lured him away from pro football in 1930. In 1931, he was named head coach of the Blue Hens. In three years at the helm in Delaware his teams went 12–9–4. In 1934, he left football for private business. He had begun working for Prudential Insurance after leaving Penn in 1927 and continued to work in that industry. Charley lived to the age of 83, passing away in 1986.